The primary advantage of a laptop PC is portability, but it's a bit cumbersome if you try to carry one with the display open. Wouldn't it be nice if the laptop PC wouldn't shut off when you close the display? This is actually an easy feature to configure. 1. In Control Panel open the Hardware and Sound group. 2. In the Hardware and Sound group, under Power Options, click on the Change what the power buttons do link. 3. 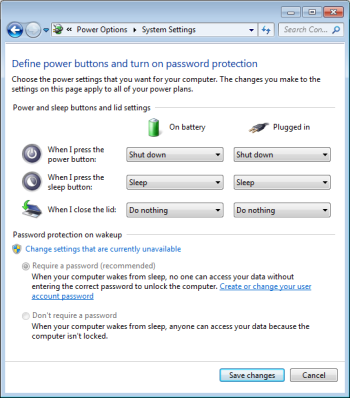 Under Define power buttons and turn on password protection, in the When I close the lid: drop-down list, select Do nothing. 4. Then click on the [Save Changes] button and close the Define power buttons and turn on password protection dialog box. Now you can close the display and carry the laptop without it shutting off.